Humble encounters: what privilege do I really own? That chant, spoken en masse at a Chicago Black Lives Matter protest and march, keeps reverberating in my head and heart. It stirred me as lines and lines of blacks, whites, young, old, middle-aged, parents pushing strollers, workers carrying briefcases and placards paraded past me on a Loop street corner, bookended by police on bicycles. The whites who’d duct-taped their mouths were powerful metaphors. Walking with my teenagers to meet my husband for an early dinner, I’d encountered the group. I desperately wanted to throw in with them, even for the half block to the restaurant. I didn’t. 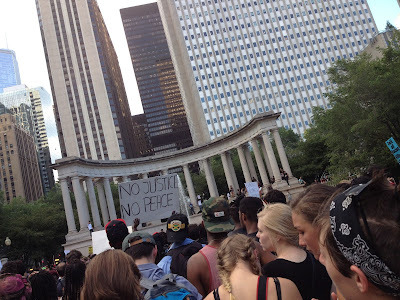 After dinner, we strayed to Millennium Park, where the march coincidentally led. My youngest and I worked our way closer and joined hands with the protesters. We widened our circle and embrace to include newcomers. This wasn’t about race, it was about justice. As a white person with privilege I have not earned, I wanted to BE with my suffering brothers and sisters, to share their pain and plight. To listen and understand with my heart. God had called me to this place. I had just spent the weekend at the most inclusive, beautiful wedding with a rainbow of guests, learning that, if transitioning from female to male, your maternal grandfather is you best reference for “how furry” you’re likely to become. And that a committed couple – no matter their sexual identity or preference – can love more profoundly than you’ve ever witnessed at a wedding. I was inspired at the open atmosphere and the courage of people being who they truly are. God smiled that day. Approached on the subway by a gentleman trying to get his life on track after prison, I handed him $10. “Mom,” one daughter said, “didn’t you mean to give him a one?” I hadn’t. He asked for a quarter and God said to give him more. The morning we were leaving, we met Dash, a four-year-old probably on the Autism spectrum, at breakfast. He’d wandered outside while his father paid. I had waved to him in the window. He asked if we were strangers. After exchanging names, said we weren’t and invited us to his house. He wanted to know if he could have a turn sitting under the umbrella-ed table. I moved over and his father joined me. While my husband and Dash’s father engaged in shop talk, I searched my wallet for change, tossing coins on the ground to confine Dash’s treasure quest to where his father could see him. Later, my husband said the father expressed gratitude that his son was manageable. They were having breakfast before Dash’s therapeutic school began. God was teaching the value of looking deeper at people and circumstance. We were accompanied by several sight-impaired young adults and their aids on our last ride into the city. Later, my oldest spied them at the French Market having coffee. They were out for an adventure many of us take for granted. God was tossing me a pun: look at the world with your heart, not your eyes. The entire trip was riddled with humble encounters signaling that, indeed, the last are first. What privilege do I really own? God’ grace and guidance. • How have I been humbled? • When has God spoken to me through an encounter with another? • When have I followed God’s nudge? • Where do I experience God’s richness in my life?